Were Pentangle a folk group, a folk-rock group, or something that resists classification? They could hardly be called a rock & roll act; they didn't use electric instruments often, and were built around two virtuoso guitarists, Bert Jansch and John Renbourn, who were already well-established on the folk circuit before the group formed. Yet their hunger for eclectic experimentation fit into the milieu of late-'60s progressive rock and psychedelia well, and much of their audience came from the rock and pop worlds, rather than the folk crowd. With Jacqui McShee on vocals and a rhythm section of Danny Thompson (bass) and Terry Cox (drums), the group mastered a breathtaking repertoire that encompassed traditional ballads, blues, jazz, pop, and reworkings of rock oldies, often blending different genres in the same piece. Their prodigious individual talents perhaps ensured a brief lifespan, but at their peak they melded their distinct and immense skills to egg each other on to heights they couldn't have achieved on their own, in the manner of great rock combos like the Beatles and Buffalo Springfield. 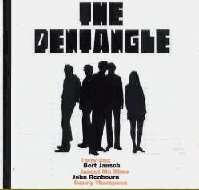 When Pentangle formed around late 1966 or early 1967 (accounts vary), Jansch and Renbourn had already recorded one album together (Bert and John), and done some solo recordings as well. Jansch was more inclined toward blues and contemporary songwriting than Renbourn, who was stronger in traditional British folk music. Jacqui McShee, whose bell-clear, high singing set the standard (along with Sandy Denny) for female British folk-rock vocals, began rehearsing with the pair. After a false start with a forgotten rhythm section, Thompson and Cox - who had been working with Alexis Korner - were brought in to complete the quintet. Pentangle's first three albums - The Pentangle (1968), the double LP Sweet Child (1968), and Basket of Light (1969) - are not only their best efforts, but arguably their only truly essential ones. With Shel Talmy acting as producer, the band rarely took a misstep in its mastery of diverse styles and material. Thompson and Cox gave even the traditional folk ballads a jazz swing and verve; the guitar interplay of Jansch (who was also a capable singer) and Renbourn was downright thrilling, each complementing and enhancing the other without showing off or getting in each other's way. McShee's beautiful vocals, though not as emotionally resonant as her close counterpart Sandy Denny, were an under appreciated component to the band's success with the pop audience. And Pentangle were very popular for a time, at least in England, where Basket of Light made number five, and "Light Flight" was a small hit single. They introduced some electric guitars on their early-'70s albums, which generally suffered from weaker material and a less unified group effort. The original line-up broke up in 1973; Jansch and Renbourn (who had never really abandoned their solo careers) continued to record often as soloists, and remained top attractions on the folk circuit. Thompson joined John Martyn for a while, and has remained active as a session musician, in addition to recording some work of his own for the Hannibal label. The original group reunited for the reasonably accomplished Open the Door album in the early '80s, and other versions of the group recorded and toured throughout the '80s and '90s, usually featuring McShee and Jansch as the sole remaining original members.